Your DNA source will be adding new kits often. You may update your matches, segments, ICWs and triangulations at any time. 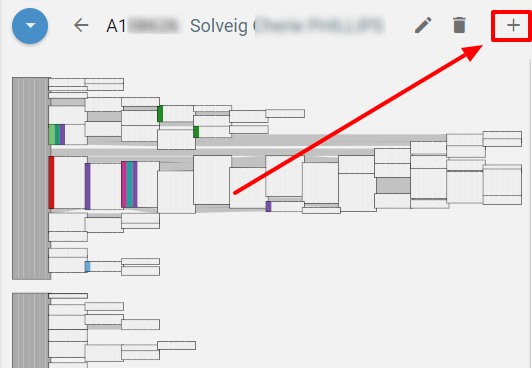 Click on the "+" near the upper-right corner of the List view, Segment View or Triangulation View. 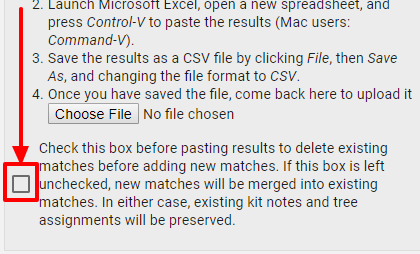 Click on the check box if you want to delete existing matches before adding new matches. If this box is left unchecked, new matches will be merged into existing matches. In either case, existing kit notes and tree assignments will be preserved. Use the same procedure for creating the spreadsheets as you used to import your DNA data the first time. Please see, How to Import 23andMe DNA Data, How to Import Ancestry DNA Data, How to Import FamilyTreeDNA Data, How to Import GEDmatch DNA Data, or How to Import MyHeritage DNA Data for step by step instructions. Note: Profiles are specific to your DNA source. You must use the same source to update your DNA data as you used for the first import. If you wish to look at DNA data from a different source, you must create another profile. Clicking on the trashcan icon deletes everything in your profile. If you wish to update one or more of your DNA views with new kits, data, etc., please use the checkbox explained above.